For service to the Community through bell ringing. 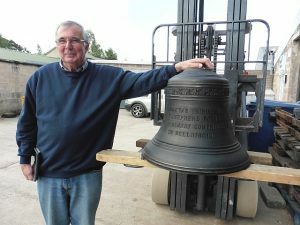 Ron has spent countless hours with bellringing, whether it be looking around country towns to see if a local church could take a ring of bells, or having initial talks with church authorities about fundraising for a new ring of bells. He has consulted with locals to help build bell frames and other internal parts of the tower, and helped with the teaching of new learners. Ron has devoted immense energy and time to the installation of new rings, and on top of all this he still manages to ring regularly at his home tower for Sunday service ringing. Ron’s quiet and gentle approach has worked well in explaining to church authorities the nature of the project they’re about to embark on. It is a matter of record that more than a third of Australian bell installations in towers affiliated with ANZAB are the result of Ron’s endeavours, and we cannot discount the number of new ringers who have joined ringing as a result. Ron is well known throughout ANZAB. He was made an Honorary Life Member of the Association in 1996. ← ART Conference 2019 – Goes to Worcester!